Apple on Wednesday announced the launch of the fourth generation of its Apple Watch at an event in the company’s Steve Jobs Theater in Apple Park, Cupertino. The latest smartwatch from Apple comes with a new design and larger display – one with thinner bezels compared to last year’s model. It also features ECG functionality that has been given a ‘De Novo’ classification by the US FDA. Other highlights include a ceramic build, optical heart sensor, swimproof capabilities, and more. The Apple Watch Series 4 has been priced at $399 (roughly Rs. 28,700) for the GPS-only, non-Cellular variant, and $499 (around Rs. 35,900) for the variant with both GPS and Cellular capabilities. This pricing is the same as that of last year’s Apple Watch Series 3. The latest Series 4 will be available for pre-orders starting September 14 and will go on sale starting September 21 in 26 markets at launch for the GPS-only variant, and 16 markets for the GPS+Cellular variant at launch. Apple’s new watchOS 5 will be available for other Apple Watch models starting September 17. As far as India is concerned, pricing and availability details haven’t been revealed yet. 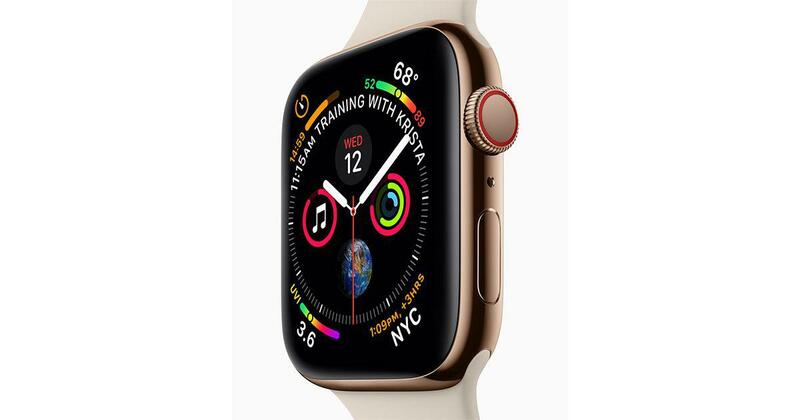 The Apple Watch Series 4 comes with built-in fall detection that can alert emergency services and SOS contacts immediately. Other additions include a ‘low heart rate’ notification, alerts for atrial fibrillation, and electrocardiogram (ECG). Williams stated this is the first ECG product available over the counter, directly to the customer. The results of the new ECG app will be stored in the Health app on your iPhone, and can be shared in the form of a PDF file. These new health features will be available for US customers later this year. The new smartwatch is touted to be swimproof, has Bluetooth v5.0, and has an optical heart sensor. Apple Watch Series 4 is powered by the latest watchOS 5 – with the UI optimised for the larger display. Apple also showcased certain new watch faces including a new modular face, one with the ability to add several health and fitness statistics, and three new minimal faces to cut down on the amount of information for users who prefer it that way. New watch faces based on fire, water, and vapour effects were also introduced.